Hello Scrapping Cottage friends! Thanks for taking the time to stop and visit today. It's Mary Marsh here bringing you the Saturday edition of the Blog. This is a 2 part post and today is Part 1. I will have the 2nd part on the Blog tomorrow, March 12. There was a new stamp & die combo release back in January of some really cute kitchen style stamps. 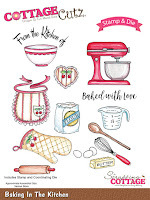 I thought "The Baking In The Kitchen" set would make a cute gift for a bridal shower. The last few bridal showers I attended they asked us to bring a copy of our favorite recipe to give to the Bride. I always want to give her a recipe on a cute pre-made card. But, sometimes I don't have the right one on hand. Now I can always make my own original and unique designs. So I decided to make some recipe cards using the Envelope Punch Board and add some of the elements of this new stamp & die combo. Let's get started on how I created my project today. Step 1. I started by cutting the white cardstock to measure 5" x 3 1/2". I placed it on the punch board right at the place where it says score guide and made my first punch. I then moved it over to the 2 1 /2" marker and punched again. I now have the start of my recipe card. Step 2: To make this look like a recipe card, I cut the section of cardstock to the right of my 2nd punch. I wanted a rounded corner so I placed it back in the Punch Board. There is a corner rounder on the back of the Board. Step 3: My recipe card is now ready to be stamped with the "From the Kitchen of" sentiment. I also stamped lines on the recipe card. This is a stamp from my own collection. I made 4 of these cards for my little gift. Now the cards are ready to add some embellishments. Step 4: I stamped the images with Memento Black ink and then colored with various alcohol markers. Once the coloring was finished I used the matching dies to cut them out and attach to my recipe card. Recipe cards are done and ready for a delicious recipe to be added to them. This completes Part 1 of my post. Tomorrow I will post the 2nd installment. I have made a mini file folder to present the recipe cards. So tune in then. How creative are these recipe cards! And what a great idea for a bridal shower gift -- you have to get the new bride off on the right foot. I love your idea with the cards and how you used the punch. Great idea for a gift. Mary, your recipe cards are very creative and a wonderful gift idea. The tutorial is fantastic and easy to follow. Great art, Mary! This is such a great idea for gift giving! These recipe cards would be great for layout pages too! Thanks for the inspiration! I love how you made your recipe cards!! Fabulous idea and darling cards! What a great idea Mary! I can use this idea for when I bring dishes to pot luck gatherings too. Seems like everyone always wants the recipe. Looking forward to Part 2! What a wonderful and creative idea! So cute too. What a wonderful way to use these stamps.